To Cite: Ranjbar Kermani F, Amini Kafi-Abad S, Mousavi Hosseini K, Maghsoudlu M, Sharifi Z, et al. Evaluation of the Performance Characteristics of an In-House One Step TaqMan Real Time-Polymerase Chain Reaction Assay for Detection and Quantification of Hepatitis C Virus, Jundishapur J Microbiol. 2017 ; 10(3):e42884. doi: 10.5812/jjm.42884. Background: With the improvement of quantitative molecular hepatitis C virus (HCV) RNA assays, the usefulness of these assays has been indicated for management of HCV infection. Recently, various real time assays with different methodology and performance characteristics have been introduced. Objectives: This study aimed at designing, developing, and evaluating an in-house 1 step TaqMan real time-polymerase chain reaction (RT-PCR) assay for detection and quantification of HCV-RNA. Methods: The primers and probe were selected from a highly conserved region of the HCV genome, which allowed the detection of 4 common HCV genotypes in Iran. Using 4 quantification standards from 101 IU/µL to 104 IU/µL and clinical specimens, the current study determined analytical sensitivity, linear range, precision, analytical and clinical specificity, and validity of the assay. Data was analyzed by the SPSS statistical software (version 16). Results: The sensitivity of the assay with 95% probability, determined by probit analysis, was 15 IU/µL. The assay showed a linear range of 101 IU/µL to 104 IU/µL (R2 = 0.989). The coefficient of variation for intra and inter assay precision of the assay, based on threshold cycle value, ranged from 0.24 to 0.4, and from 1.94 to 3.19, respectively. The analytical and clinical specificity was 100%. No bias in relation to concentration between the results of 29 HCV RNA positive clinical specimens, simultaneously tested by artus HCV LC RT-PCR reagents and in-house reagents, was observed in the method comparison. Conclusions: The in-house 1 step TaqMan Real Time RT-PCR assay showed acceptable performance characteristics. Our study presents the robustness and cost-effectiveness of the method for detection and quantification of HCV RNA. Hepatitis C virus (HCV) is still a major health care problem all over the world. It is the main cause of liver disease and liver transplantation. Over 180 million individuals are affected worldwide. Chronic disease develops in approximately 75% to 85% of HCV-infected individuals (1, 2). Viral load testing and genotyping are 2 essential tools for management of HCV infection. Hepatitis C Virus quantification and HCV genotyping are used to determine duration and dose of viral therapy and probability of virological response. Patients with viral load less than 600,000 IU/mL and those with HCV genotype 2 or 3, have higher sustained virological response rates (3). At least 2 log10 unit decrease in HCV RNA viral load compared to the initial level of HCV RNA level after 12 weeks of treatment, indicates early virological response (4, 5). Various food and drug administration (FDA) approved assays based on different methodologies are available for quantification of HCV RNA, with different performance characteristics. For example, Quantiplex b DNA v 3.0 uses branched DNA amplification method, and COBAS Amplicore v2.0 has a limit of detection of 615 and 600 10 IU/mL, with a linear dynamic range of 4.1 and 3.1 log10, respectively (6, 7). Real time-polymerase chain reaction (RT-PCR)-based method has been introduced in routine diagnosis and quantification of HCV RNA with high sensitivity and dynamic range (1, 8). The basis of RT-PCR is to detect and quantify a fluorescence, which creates a signal, increased relatively with the amount of PCR product at each cycle, and monitors the PCR reaction during the exponential phase. Hydrolysis probes, by using TaqMan probes, are 1 of the fluorescence monitoring systems in real time PCR that specifically bind between 2 primers in the target sequence (9). In the last decade, several commercial or in-house TaqMan real time systems have been introduced with acceptable performance characteristics (8, 10-18). Due to increasing sensitivity of quantitative assays, they are recommended for detection and quantification of HCV RNA in seropositive patients (7). In the present study, an in-house 1 step TaqMan real time RT-PCR assay for detection and quantification of hepatitis C virus was designed and optimized with primers and probe, selected from a highly conserved region of HCV genome, cited at the 5’ non-coding region (5’NCR) that simultaneously detects common HCV genotypes in the country. Performance characteristics including, analytical sensitivity, linearity, precision, analytical and clinical specificity, and trustworthiness of the assay, was evaluated to ensure accurate and precise results. 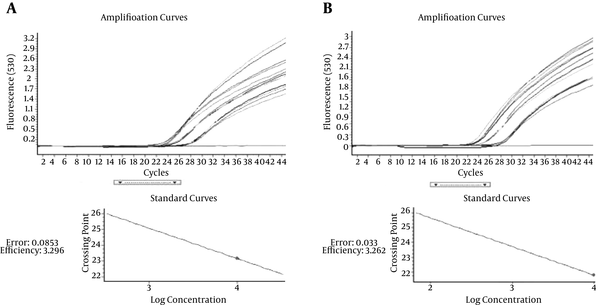 Four HCV RNA quantification standards (QS) from 101 IU/µL to 104 IU/µL of the artus HCV LC RT-PCR reagent (Qiagen, Hamburg GmbH, Germany) were used for analytical performance, including sensitivity, linearity, and precision. All standards were calibrated against the world health organization (WHO) international HCV RNA standard. For evaluation of trustworthiness, extracted RNA from plasma samples of 56 patients, referred to our laboratory for routine quantification of HCV-RNA from January 2015 to April 2015, were simultaneously tested by the artus HCV LC RT-PCR reagents (Qiagen, Hamburg GmbH, Germany), according to the manufacturer's instructions and by the in-house 1 step TaqMan RT-PCR assay. Clinical specificity was determined by testing 100 HCV RNA negative serum samples. The QiaAmp UltraSens Virus kit (Qiagen, Germany) was used for RNA extraction according to manufacturer's instructions. This study was approved by the Ethics Committee of High Institute for Research and Education in Transfusion Medicine, Tehran, Iran (code No: IR.TMI.REC.1394.1800). The in-house 1 step TaqMan RT-PCR reagents were designed and developed in blood transfusion research center, high institute for research and education in transfusion medicine, Tehran. A set of PCR primers and a TaqMan probe were selected from highly conserved sequences of the HCV genome, cited in 5’ non-coding region (5’NCR) (Table 1). The primers and probe were designed and used for amplification and detection/quantification of 5’NCR of HCV genome. The region covers all different HCV genotypes, which are currently found in Iran. Sequence of primers and probe were aligned against known HCV genotype by ClustalW2. Real time HCV RNA PCR was performed using the in-house 1 step TaqMan real time RT-PCR reagents and light cycler instrument (version 2). Briefly, 2 µL of each extracted RNA sample was added to individual capillaries (Light Cycler Roche, Germany) containing 18 µL of 1 step qRT PCR master mix, consisting of Tris-HCl 100 mM, KCl 0.001 M, 0.4 µM of each primer, 0.2 µM probe, Albomin, Superscript Ш Reverse Transcriptase (200 U/µL, Invitrogen, USA), RNasin (40 U/µL, Promega, USA), HS prime Taq DNA polymerase (1.5 Unit per reaction, Genet Bio, South Korea), and 10 mM dNTP. The program of thermal cycling was performed as follow: 50°C for 15 minutes for reverse transcription and 94°C during 10 minutes for activation followed by 45 cycles of 95°C for 5 seconds, 60 cycles for 20 seconds and 72 cycles for 10 seconds. Finally, a cooling step was done at 40°C for 30 seconds. During each run, for prevention of false positive results, we used a no template control (NTC). Data analysis was conducted by the SPSS statistical software (version 16). Descriptive analysis was used to calculate mean, standard deviation, and coefficient of variation. Analytical sensitivity was determined using probit analysis. Linearity was performed by linear regression. For evaluation of trustworthiness of different methods, bias, and limit of agreement between quantitative results the Bland and Altman methods were used. P values of less than 0.05 were considered significant. Three quantification standards (QS) from 101 IU/µL to 103 IU/µL concentrations were tested in 8 replicates on 3 different days. Analytical sensitivity was determined by probit analysis. The 1 step TaqMan RT-PCR system was able to detect 15 IU/µL, with a probability of 95%. The linearity of the 1 step HCV quantitative real time RT-PCR system was determined using all 4 quantification standards (QS) from 101 IU/µL to 104 IU/µL concentrations, tested in quadruplicates on the same day. Result values were transformed to log10. 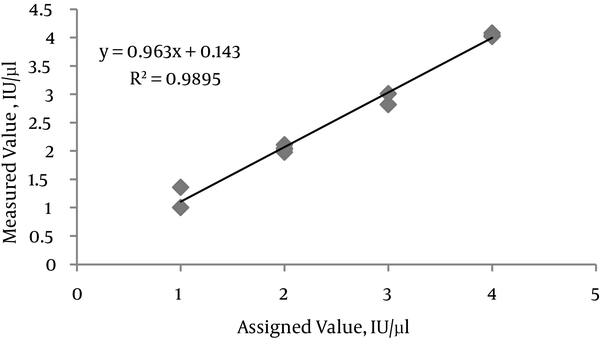 Linear correlation between the quantification values and corresponding expected values in ranges from 101 IU µL to 104 IU/µL was confirmed (R = 0.989).The slope of the line in linearity analysis was close to ideal slope of 1 (Figure 1). Each point represents the result of four replicates of each concentration, tested in the same run. The mean coefficient of variation (CV) in tested concentrations was 2.71%, ranging from 0.74 to 4.46 and standard deviation (SD) in all tested concentrations was lower than 0.14. Correlation coefficient (R2) between threshold cycle (Ct) values and quantification values (log10) in each tested concentration was 0.95 and the slope of the log10 - linear phase was - 3.296. Four quantification standards (QS) from 101 IU/µL to 104 IU/µL concentrations were tested in quadruplicate in 1 day for evaluation of intra assay variability and in 5 days for evaluation of inter assay variability of 1 step TaqMan real time RT-PCR system. The precision data was calculated based on Ct values of the quantification curve. Intra and inter assay CV of the in-house 1 step TaqMan real time RT-PCR assay, ranged from 0.24 to 0.4 and from 1.94 to 3.19, respectively. The primers and probes were checked and compared with all sequence published in gen bank using NCBI Nucleotide BLAST software. Due to selection of primers and probe from highly conserved region of HCV genome (NCR), no homology to other sequence was observed. A potential cross reactivity of the 1 step TaqMan real time RT-PCR system was assessed by testing of a set of DNA/RNA extracted from patients infected with some blood transmitted viruses or similar to HCV genome viruses and human genomic RNA was tested in triplicate. No cross reactivity was observed. The results were shown in Table 2. No positive result was obtained in testing of 100 HCV-RNA negative serum by using the 1 step Taqman real time RT-PCR assay. Twenty-nine out of 56 clinical specimens had a detectable HCV RNA of various HCV RNA levels, tested simultaneously by both the artus HCV LC RT-PCR (Qiagen) and the 1 step TaqMan real time RT-PCR assays on different days. The amplification plots of clinical specimens with detectable HCV RNA obtained from the in-house and commercial reagents during 1 day were shown in (Figure 2A and 2B). All data from 29 clinical specimens are not shown. A standard Bland Altman plot was used as a method of choice for measuring agreement between the 2 assays (Figure 3). The mean difference between values of 2 assays was -0.48 log10 ± 1.19 with limits of agreement of -1.67 to 0.71 log10 IU/µL. All but 1 of the differences fell within the limit. No statistical evidence of bias was observed in relation to the concentrations. A, Using the artus HCV LC RT-PCR (Qiagen) assay; B, Using the one step TaqMan Real Time RT-PCR assay. The graph shows a scatter plot of the differences and mean levels of two measurements (in log10) in Y-axis and X-axis, respectively. The limits of agreement were determined as mean differences ± 2SD of the differences. With the improvement of antiviral therapy, quantification of HCV RNA is an essential tool for management of HCV infection. A number of TaqMan RT-PCR assays have been introduced to quantity HCV RNA with high sensitivity and broad dynamic range to provide precise quantification of HCV RNA viral load (13). According to Clinical laboratory improvement amendments (CLIA), regulation revised in January 2003, performance characteristics of the test must be set up for laboratory-developed tests (19). In this study, performance characteristics of an in-house 1 step TaqMan real time RT-PCR assay was evaluated. The analytical data showed that the sensitivity of the assay was 15 IU/µL without consideration of the extraction. There was a good correlation between the quantification values and corresponding expected values in ranges from 101 IU/µL to 104 IU/µL. The dynamic range of the assay covers all concentrations tested from 101 IU/µL to 104 IU/µL (linear dynamic range of 3 log10). Study on an in house TaqMan qRT-PCR assay conducted by Albertino, showed a limit of detection of 310 copies/mL and dynamic range of 3 log10, from 3.1 × 102 to 3.1 × 105 copies/mL (15). Another study on a developed multiplex real-time PCR assay for simultaneous detection of HCV and human immunodeficiency virus (HIV) using molecular beacons reported by Paryan et al. showed analytical sensitivity of 100 copies/mL (16). In the study of Fahliani et al. on an in-house TaqMan real time RT-PCR assay to quantity HCV RNA, the limit of detection was 100 copies/mL (17). The other study on an in-house real-time reverse transcriptase polymerase chain reaction reported 50 IU/mL as the lower limit of detection (18). We did not examine linearity with reference material with lower and higher concentrations than those used in this study, thus for accurate quantification of HCV RNA in clinical samples with baseline viral load higher than the upper limit of the assay, the samples should be diluted and retested (12, 17). The efficiency of the assay was acceptable, due to the slope of the log10-linear phase (20). The average CV of 3.81% log10 and the SD less than 0.13 in full concentration, presented acceptable precision to define the dynamic range for this type of assay (21). The repeatability and reproducibility of the in-house 1 step TaqMan real time RT-PCR assay was acceptable (21), and intra assay CV was lower than inter assay CV in each testing concentration. Both analytical and clinical specificity of the kit were 100%. No bias was observed in the method as examined on 29 clinical positive specimens. There was good agreement between artus HCV LC RT-PCR (Qiagen) and 1 step TaqMan real time RT-PCR assays. 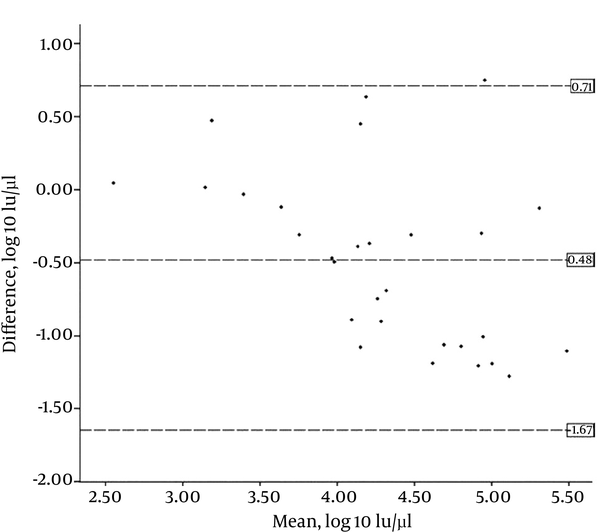 The mean difference in quantification was less than 0.476 log10 IU/µL (less than 3 folds). It has shown that this level of difference is acceptable and not important compared to different methods for quantification of HCV RNA (22). Moreover, according to the national institutes of health (NIH) for management of hepatitis C, the usefulness of HCV RNA quantification in monitoring antiviral therapy was evident when the assays used to determine pretreatment HCV viral load and serial viral load during the treatment were the same (23). Some limitations of this study were as follow: in analytical performance, because of using quantification standards with 4 limited ranges, we could not define the linearity in wider ranges. For better presentation of the analytical performance characteristics of the assay, study on the WHO standards of HCV RNA is recommended. In this study, we evaluated the performance characteristics of an in house 1 step Taqman real time RT-PCR assay and compared the clinical results of the assay with those obtained by the artus HCV LC RT-PCR assay (Qiagen). The presented in-house assay showed acceptable performance characteristics in addition to robustness and cost-effectiveness. It seems that the assay is eligible for HCV RNA detection and quantification. We would like to thank the blood transfusion research center, high institute for research and education in transfusion medicine, Tehran, Iran, for financially supporting the study. The authors thank all colleagues for their technical help at the diagnostic research and development laboratory, blood transfusion research center, Tehran, Iran. Authors’ Contribution: Sedigheh Amini Kafi-Abad is the corresponding author; Fahimeh Ranjbar Kermani performed the experiments, data analysis, and manuscript preparation. Sedigheh Amini Kafi-Abad and Kamran Mousavi Hosseini supervised the study. Mahtab Maghsoudlu and Zohre Sharifi were the advisors of the study. Shahram Samiee provided material support. All authors read and approved the final manuscript. Financial Disclosure: The authors had no conflicts of interest. Funding/Support: This study was supported by the high institute for research and education in transfusion medicine, research center of blood transfusion, Tehran, Iran.